Failed the audition for "Got Milk". He did not understand. I kept saying, it needs to be on your upper lip! 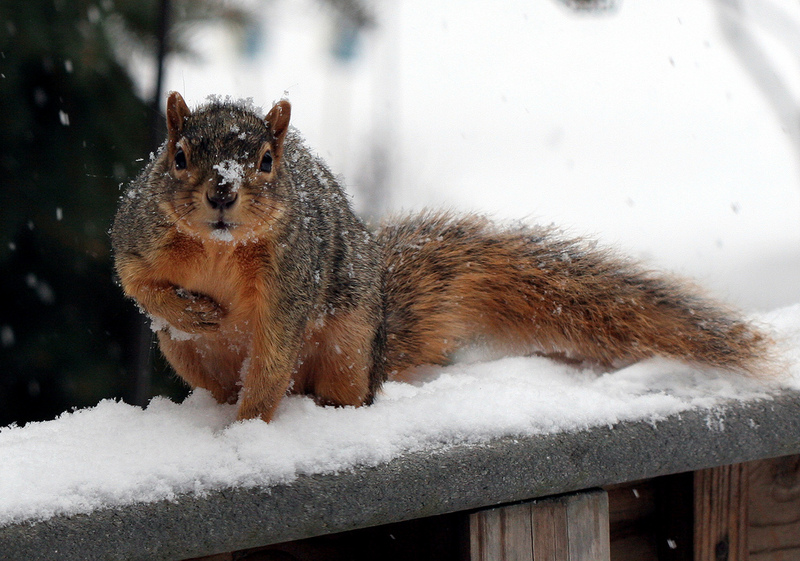 January 21 is National Squirrel Appreciation Day and I was watching the squirrels acting squirrely in the yard today. January and February is when squirrels begin looking for mates. You'll see them zig zagging around the yard with the males following females and fighting with other males. The backyard tree squirrels in mid-Michigan are fast. They chase each other around and avoid predators at an average speed of 10-20 miles per hour. They have long, muscular hind legs and short front legs that work together to aid in leaping. They can jump 10 feet from a tree to a bird feeder or straight up an average of 4 ft. The hind legs of squirrels are double-jointed. This helps them run up and down trees quickly. Why are they called squirrels? Wikipedia explains that the word squirrel came from the early 14th century Anglo-Norman word esquirel and from the Old French escurel, which is the reflex of a Latin word sciurus. This Latin word was itself borrowed from Ancient Greek word σκίουρος, skiouros, which means, are you ready… shadow-tailed. This is probably because the squirrels use their bushy tails to shade themselves. So for everyone who thought squirrel meant “clever creature sent to drive me crazy” or “batty rat that can figure out any bird feeder” now you know it means "beautiful beastie with a bushy tail". Why do squirrels chew on everything? Squirrels, nibble, gnaw and chew on anything and everything to sharpen and shorten their teeth that grow continuously. Squirrels’ teeth grow very fast and they wear them down by cracking nuts, trimming trees, and attacking bird feeders. If they didn’t, we’d have saber toothed squirrels running around. How big is a squirrel’s brain? You are what you eat. A squirrel’s brain is about the size of a walnut, one of their favorite foods. They can eat their own body weight (approximately 1.5 pounds) every week. Squirrels are mostly vegetarian but sometimes they do eat small insects. 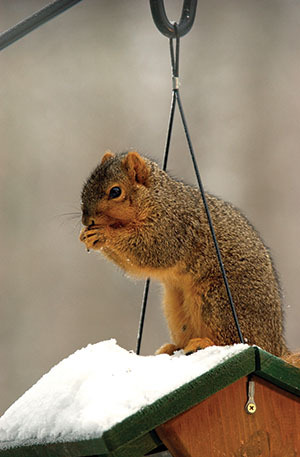 To celebrate National Squirrel Appreciation Day, come in to the Wild Birds Unlimited - East Lansing store for some Wildlife Blend which is full of nuts and seeds the squirrels love on January 21.